The best strategies for helping them cope with their emotions. At any age, crying is a normal response to being overwhelmed by strong feelings, like anger, fear, stress or even happiness. Some children, however, cry more than others. Those same children may get angry more often, may feel frustrated faster, and may get overly excited compared to their peers too. While there’s certainly nothing wrong with an overly emotional child, it can make life a little bit more difficult for them. Here are several tips for helping your child have emotional awareness and healthy coping skills. Sometimes parents are embarrassed by overly emotional kids. A father may cringe watching his son cry after losing the baseball game or a mother may usher her daughter out of dance class at the first sign of tears. But crying isn’t a bad thing. And it is OK for kids to have intense feelings. Being emotional doesn’t make a child weak. It is important, however, for kids to learn to recognize and understand their emotions. In fact, emotional awareness can help kids be mentally strong—even when they feel those emotions deeply. Avoid calling your child a wimp or assuming his sensitivity has to be fixed. Everyone has a different temperament and your child may have been born with more emotional sensitivity than you are used to. It’s important for your child to recognize her feelings. Start teaching her about her emotions by naming them for her. You can also strike up conversations about feelings by talking about characters in books or on TV shows. Every once in a while and ask questions such as, “How do you think this character feels?” With practice, your child’s ability to label her emotions will improve. It’s also important for children to learn how to express their emotions in a socially appropriate manner. Screaming loudly in the middle of the grocery store or throwing a temper tantrum at school isn’t OK.
Tell your child that she can feel any emotion she wants—and it’s OK to feel really angry or really scared. But, make it clear that she has choices in how she responds to those uncomfortable feelings. So even though she feels angry, it’s not OK to hit. Or just because she feels sad, doesn’t mean she can roll around on the floor crying when it disrupts other people. Sometimes parents inadvertently minimize a child’s feelings. But that sends the wrong message. Saying, “Stop getting so upset. It’s not a big deal” will teach your child that his feelings are wrong. But feelings are OK—even if you think they seem out of proportion. Whether you think she’s mad, sad, frustrated, embarrassed, or disappointed, put a name to it. Then, show you understand how she feels and provide empathy. So while saying, “I know you are mad we aren’t going to the park today,” shows you understand she’s angry, it may come across as a little harsh. Say, “I know you are mad we aren’t going to the park today. I get mad when I don’t get to do things I want to do too.” That extra element reinforces to your child that everyone feels those emotions sometimes (even if they aren’t as often or as intense as she feels them). At the same time, help children understand that emotions can be fleeting and the way the child feels now won’t last forever—or even necessarily more than a few minutes. Realizing that their feelings, as well as tears, come and go can help a child stay a little bit calmer in the midst of an emotional moment. Just because your child feels his emotions intensely, it doesn’t mean he needs to let his feelings control him. When he’s upset he can learn to calm himself down. Practice deep breathing: Teach your child how to breathe in slowly and quietly through his nose and then out through his mouth. Repeat a few more times, until he has a grasp on his tears. Count to calm down: Teach your child to distract himself from upsetting thoughts by counting. Counting ceiling tiles, counting to 10, or counting down from 100 are just a few mental tasks that might reduce his distress. Take a break: Allow your child to give herself a brief time-out or ask a teacher if she can have a minute to collect herself, whether it’s going to get a drink or water or stepping into another room for a minute. Make it clear to your child that she can place herself in time-out before she gets sent there for misbehavior. Then, she’ll be in control of deciding when he’s ready to come out. Create a calm-down kit: Fill a box with items that help your child calm down (or cheer up). Coloring books and crayons, lotion that smells good, pictures that your child enjoys, or soothing music are just a few things that can engage her senses and help her manage her emotions. Problem-solve with your child: If your child’s emotions are causing problems for him—such as no one wants to play with him because he cries all the time or he’s unable to participate in physical education because he cries if he loses—work together to address the problem. Ask for his input into what strategies might help him. He may develop some creative solutions with your support. Identify mood boosters: Talk to your child about the things she likes to do when she feels happy, like playing outside, reading a joke book, or singing her favorite songs. Write those things down and tell her those are her mood boosters. When she's feeling bad, encourage her to do one of her mood boosters to help her cope with her feelings. The way you respond to your child’s emotions makes a big difference. Sometimes parents inadvertently encourage kids to have emotional outbursts. Rewarding your child for calming down: If you offer your child a special treat every time she pulls herself together, she may learn that bursting into tears is a good way to get something she wants. Showering your child with attention: While it’s important to offer comfort, make sure you don’t overdo it. You don’t want your child to learn that getting upset is the best way to attract your attention. Constantly calming your child down: It’s helpful to offer reassurance, but it’s also important to teach your child the skills he’s going to need to calm himself down so he can handle his emotions when you’re not there to step in and help. 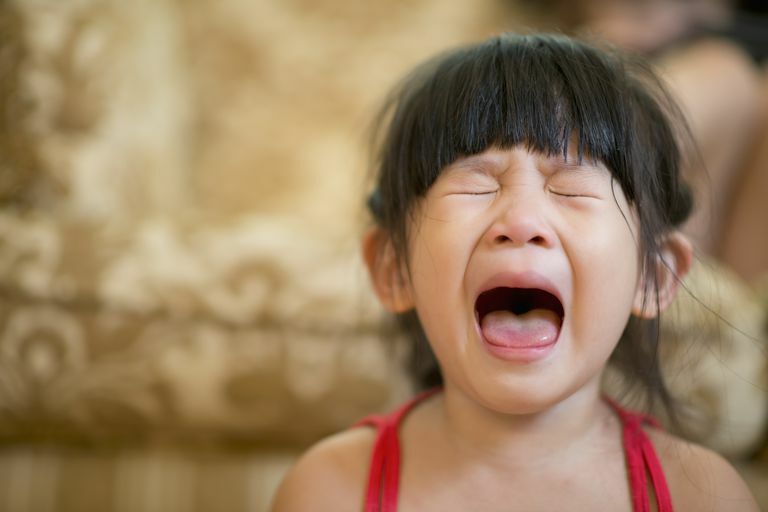 Telling your child to stop crying: Telling your child to stop crying might make her more upset. If she sees you getting worked up over her tears, she will think she’s doing something wrong—and that won’t make it any easier to stop crying. You might decide there are times when it makes sense to spare your child from upsetting events. If the school is watching a sad movie, you might decide to let your child opt out, if you know he’ll struggle to pull himself together after the movie is over. But, you don’t want to excuse your child from tough challenges or all of the realities of life. Your child needs some practice learning how to handle his emotions in a socially acceptable manner. And just because he’s overly emotional doesn’t mean he should miss out on life. Quite often, emotional kids experience all emotions in a big way. So that means your child may enjoy positive emotions, like happiness and excitement, to their fullest extent as well. And you don’t want to squash his ability to feel all of those big feelings. Even children who aren’t normally overly emotional may go through a period where it seems like the tears keep coming. While it’s unlikely that there’s a cause for concern, it’s worth checking in with your pediatrician (especially if your child is young and has a hard time communicating) to ensure there’s not an undiagnosed ear infection or language problem that hasn’t been detected. When a medical problem has been ruled out, a parent can take measures to help their child learn how to regulate their emotions at key times, so it doesn’t become an issue as they grow up. If your child has always been emotional, there’s probably no cause for concern. But, if she suddenly seems to have more trouble managing her emotions, talk to her pediatrician. You should also seek professional help for your child if her emotions are causing problems for her everyday life. If she’s crying so much during the school day that she can’t concentrate in class or if she’s struggling to maintain friendships because she can’t control her emotions, she may need some extra support. Dealing with an overly emotional child can be frustrating sometimes. Try to keep the bigger picture in mind. Your child simply may need a little extra support while she gains the skills she needs to deal with her big feelings. Wyman PA, Cross W, Brown CH, Yu Q, Tu X, Eberly S. Intervention to Strengthen Emotional Self-Regulation in Children with Emerging Mental Health Problems: Proximal Impact on School Behavior. Journal of Abnormal Child Psychology. 2010;38(5):707-720.